Imagine you are an Inca Indian, living at dizzying heights in the Andes Mountains more than 6000 years ago. Your entire culture is built around "The Mother Grain", a life-giving seed delivered from the heavens by a sacred bird. Your God-King uses a golden staff to plant the first seed every spring, and your warriors consume it to increase their endurance and spiritual awareness. It is your primary food, the linchpin of your entire society, and your connection to the Gods - you offer annual ritual sacrifices for the success of this all-important harvest. And then, the Spaniards descend upon your civilization and eradicate all trace of this wondrous seed, instead forcing you to grow corn. Your crops are destroyed, your Gods disavowed, your world crumbles. And quinoa, that fabled foodstuff, tragically disappears from view for many millennia. Fast-forward to the 1980's, high in the Colorado Rockies, where a pair of Americans who studied spirituality in the Bolivian Andes once more initiated the significant cultivation of quinoa, for the first time since the Incas were wiped from the face of the earth. Subsequently, the United Nations declared this obscure plant to be a Super-food with a protein value equal to that of milk, and NASA placed it high on its list of possible foods for long-duration manned spaceflights. 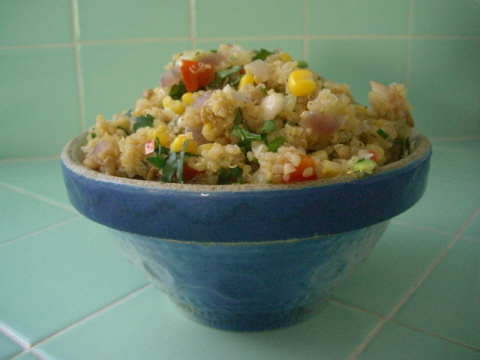 Historically, quinoa had a multitude of uses beyond its culinary status. It was employed as a compress for bruises and as a diuretic, as well as to induce vomiting. The Indians used it to treat liver and urinary tract problems, tuberculosis, appendicitis, and altitude and motion sickness. But the true overwhelming value of this ancient pseudo-grain lies in the fact that it is a complete protein. Unlike "true" grains like wheat and oats, this seed of a leafy plant related to spinach and tumbleweed contains all nine essential amino acids for protein utilization, thus making it a unique non-animal protein source. Vegans everywhere should rejoice at the re-discovery of this amazing food! Quinoa offers an especially generous dose of the amino acid lysine, which is essential for tissue growth and repair. And significant amounts of magnesium and riboflavin make quinoa particularly valuable to sufferers of migraines and atherosclerosis, as they help relax blood vessels and improve energy production within cells. Like all whole-grain high-fiber foods it provides a wide array of health benefits, such as reducing the risk of high blood pressure and heart attacks, protecting against various forms of cancer, and preventing gallstones. And those of you who are parents will be especially interested in a recent Dutch study, which indicated that a diet rich in whole grains combined with fish resulted in a 50% reduction in childhood asthma. A superb source of complete protein and a treasure-trove of additional nutrients, quinoa is indeed a "Food of the Gods", and one that may well prove an enormous boon to mankind in these times of burgeoning populations and diminishing food resources. And you'll find it will make a delicious and healthy addition to any meal! Quinoa is becoming more widely available, but will mostly be found at your local health food store. In bulk or prepackaged, select it the way you would any grain - make sure there's good turnover and that it's fresh, and that there are no signs of moisture. Store it in a sealed container in the fridge - it'll last for months. Most commercially-available quinoa has been processed to remove a bitter coating called saponin, which in nature protects the seeds from birds and heat. However, it is best to thoroughly rinse your quinoa in a fine mesh sieve under running water for a minute or two before using, to remove all traces of residue. And for a richer flavor, toast your quinoa in a dry skillet over medium-low heat, stirring constantly for about 4-5 minutes. This will give it a nice nutty flavor. Okay, so the Incas didn't have Thanksgiving - but I bet they would have loved this scrumptious vegetarian dish for their harvest celebration! In a medium saucepan, combine quinoa with broth & water and bring to a boil. Reduce heat, simmer covered for 15 minutes, until all broth is absorbed. Remove from heat, fluff with a fork and set aside. In a large saucepan, heat olive oil over medium heat. Add onion, red pepper & fennel, sauté until soft, about 8 minutes. Add garlic and thyme, cook for two minutes, stirring frequently. Add corn & soybeans, cook for a few minutes more until they're well-heated. Add cooked quinoa to the vegetable mix; cook over medium heat, stirring often, until just warmed through. Fold in the sunflower seeds, pears and parsley, with salt & pepper to taste. Serve warm or at room temperature. Serves 8-10 as side dish, 4-6 as main course. In a small saucepan, combine quinoa and water, bring to a boil. Reduce heat and simmer covered for about 12 minutes. Remove from heat, stir in honey and cinnamon. Divide between two bowls, top with blueberries and bananas and milk.